A week of sideways consolidation for the yen to dollar currency pair, following the sharp sell off the previous week, with Friday closing with a small doji cross candle to add to the two doji candles of earlier in the week. 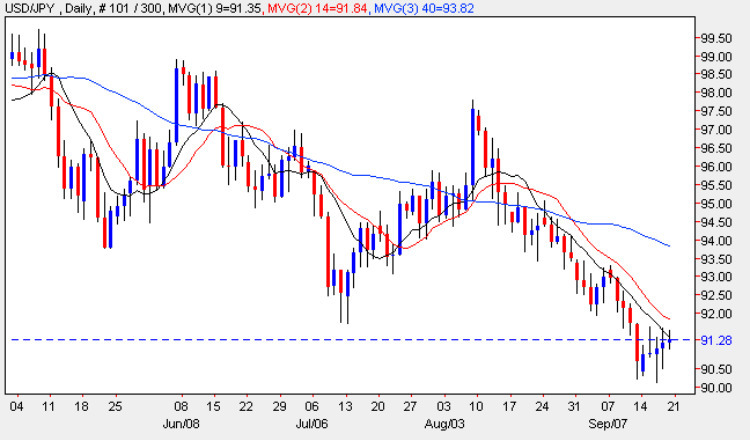 With the yen to dollar cross now firmly established below all three moving averages and with both Thursday and Friday’s price action finding resistance at the 9 day moving average, this would suggest that we will see a further period of bearish sentiment for the pair, but possibly only as far as the 0.88 price level, where a sustained area of support awaits to provide the springboard for a move higher once again. Indeed this is the price level that provided the initial surge higher early in 2009 following the long steep decline from mid 2008, and we may see this price action repeated in the medium term once again. In the short term the outlook remains bearish, and with the markets closed on Monday for a national holiday of which this is the first of three, we may see a period of sideways movement for the yen to dollar pair, before Wednesday’s FOMC rate announcement and statement in the US later in the week.